It’s been a few weeks since I last posted anything, and that’s because I’ve been busy moving house, and so amongst mowing grass (courtesy of a gift of an unwanted lawnmower from a family friend), caring for the shifted plants and seedlings, and the inevitable decorating, I’d not been out on the garden very much. This garden, I hadn’t realised when I viewed it, sits on a very sticky clay soil. I’ve not had to garden clay soil before, and so I’m a little daunted at the long process it might take to break this up a bit. However, there is great news – it’s nutrient rich, and holds the water. Bad news, tools bounce off it when it dries out, and it can delay the growing season a little until plants become established. The first bits of lawn to be broken for the first border in my new garden. There’s not much I can do but embrace it and get to work. So that’s what I’ve begun doing – but this started with the need to shift part of a pretty ridiculous patio fence enclosure, and shift it down the garden just in front of only-just-still-a-shed. The back garden runs a bit South East to North West, so the sun gets most parts of it during the day. 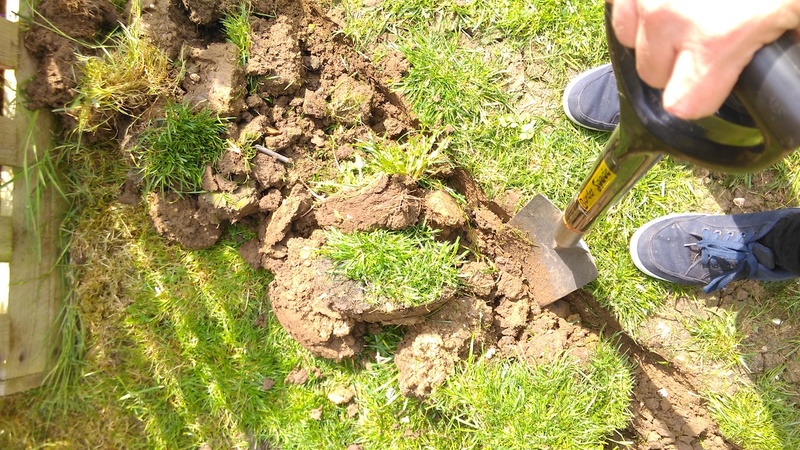 The previous owner had had a bit of a go with digging in a small 3ft x 6ft patch (approx) here, but otherwise it’s a worn lawn, and there’s no planting anywhere else. There’s some hedging alongside my fence, but these are in the neighbours’ garden, and i’m happy to have them there as the birds love them. 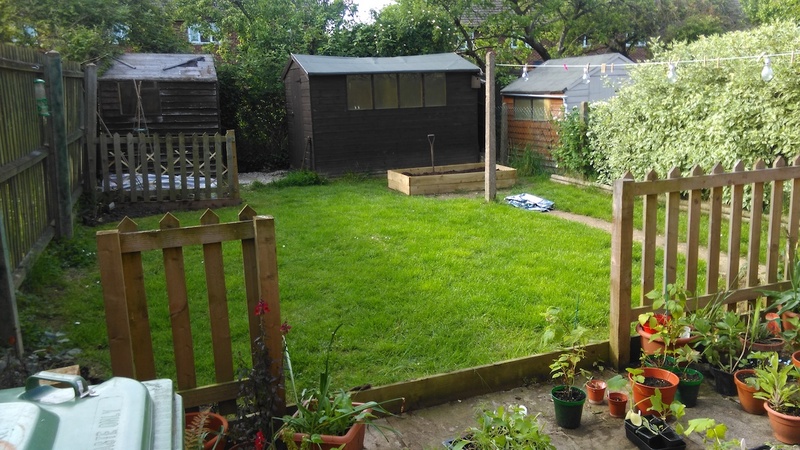 My new garden – with an old shed, a usable shed, a fenced in patio (I took that section out and took it down the garden), and the blank lawn needs some work. After some well-needed heavy rain, I was able to go out there and break the lawn, to cut in some first borders (i’ll enlarge these later), and to extend that little growing area into a bigger veggie plot that can handle my lettuce jungle, and the myriad of other items that have been screaming at the glass from my packed windowsills. In an odd corner where the previous owners giant trampoline had killed the grass, and where a rotary washing line’s sunken base was almost covered over, i’ve built a raised bed. 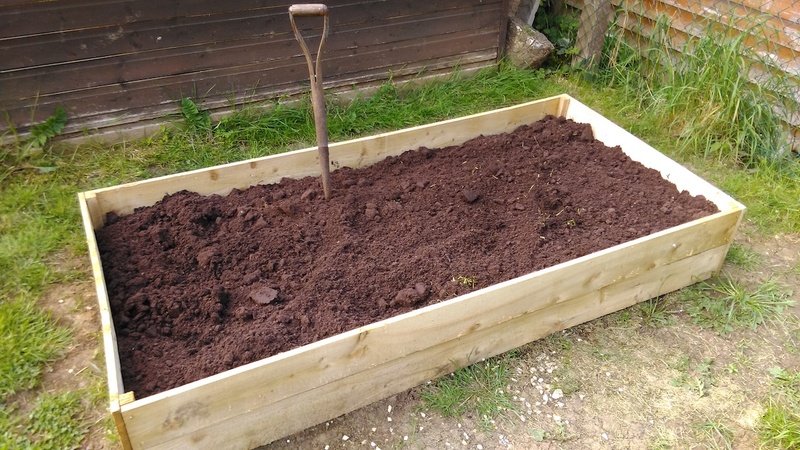 I bought two of the Homebase 6ft x 3ft kits and after wrestling with the screws, stacked them and filled them with a mixture of compressed cocoa, multipurpose compost, grass clippings, and some top soil (perhaps the odd banana skin and tea bag – i don’t remember, but it was hard work). This mixture should give the plants something interesting to grow in. I stacked two of the Homebase raised bed kits and filled it with various soils and composts. I just need to join the two levels, and it’ll all be good to grow in. I think my Squash Spaghetti Stripetti and some Courgette Black Beauty plants – which are desperately on flower at the moment, will go in here, and i might go round it with the copper tape. I don’t know how rampant the snails and slugs are in this garden compared to the last one. There’s so much to do, and some corners of the garden are already finding their flowers. For now though, happy gardening – and I’ll be back with another update real soon.